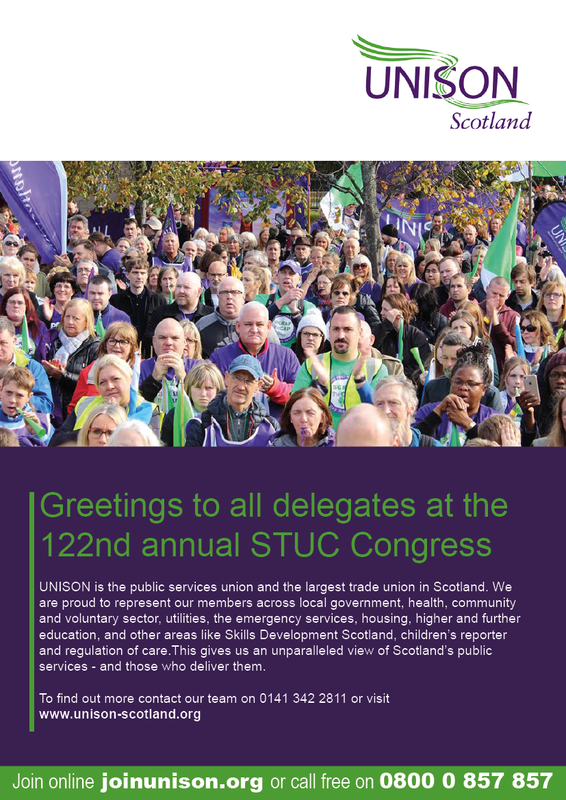 The March/April issue of Scottish Left Review is our traditional STUC congress edition. 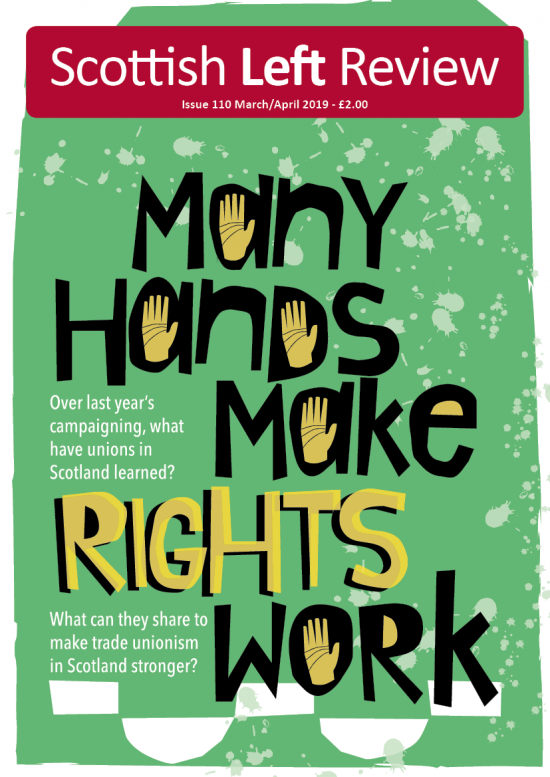 In it, we ask a variety of unions to write about the issues facing them and what they are doing about them. This year, we have tried something a bit different. 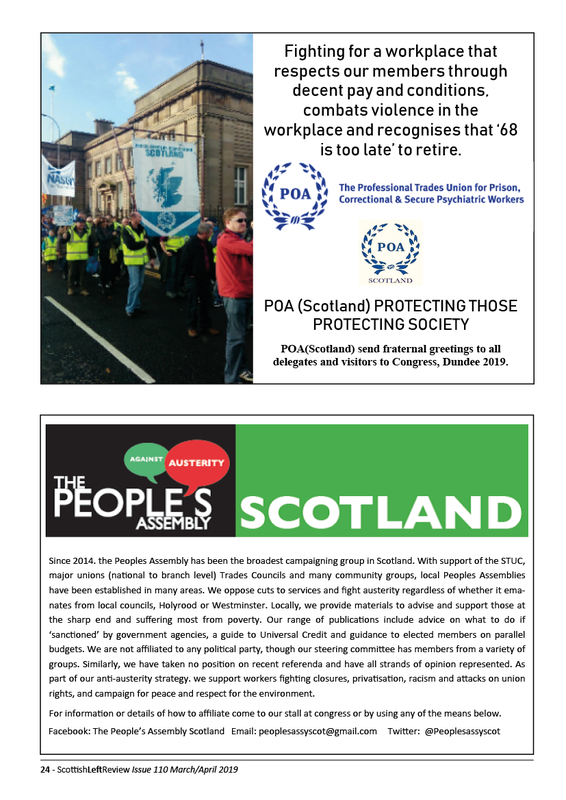 In the spirit of being a magazine seeking to act as a forum for discussing and debating a left agenda, we asked different unions to draw out what lessons they have learned from their campaigning and organising over the last year in order that other unions may benefit from these insights and conclusions. 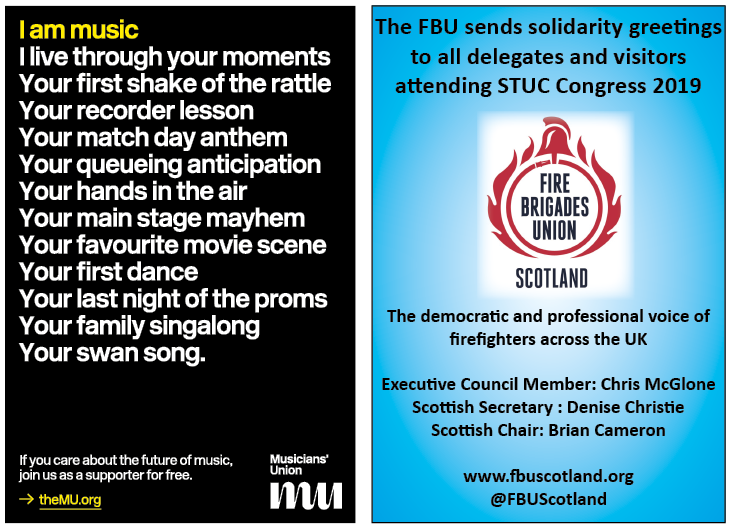 So, this is an exercise in group solidarity with the aim of making what unions do that bit more effective. Of course, none of this is plain sailing. The UCU showed that it could not only beat the Trade Union Act’s new thresholds on its ballot for strike and industrial action over pensions – see Mary Senior’s article in this issue – as well as make big steps towards winning the dispute. But alas it was a different matter over pay on both its disaggregated national ballot in 2018 and its aggregated ballot in 2019. 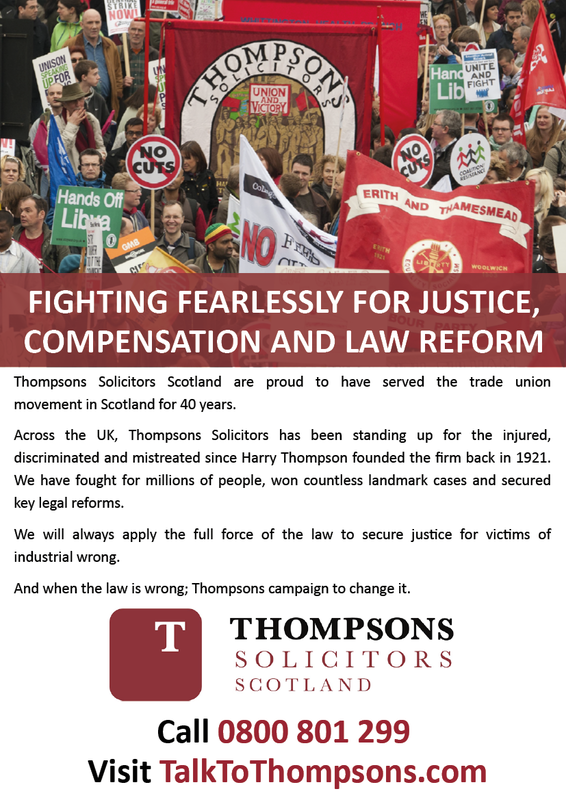 Those sets backs – along with those suffered by PCS, RMT and UNISON – are the evidence that the Trade Union Act can scupper industrial action and suggests unions may have to become more strategic in deciding upon what issues they ballot upon as well as how they campaign to achieve ‘yes’ votes. We hope the forthcoming PCS and possible EIS national ballots, both on pay, learn from this experience. Indeed, as David Belsey points out in his article, the EIS has been successful in its balloting in further education colleges and its mobilisation so far on gaining a pay rise in schools mirrors the patient slow burn approach of the CWU when it won its national ballot for action in late 2017 (see Matt Kerr’s article). 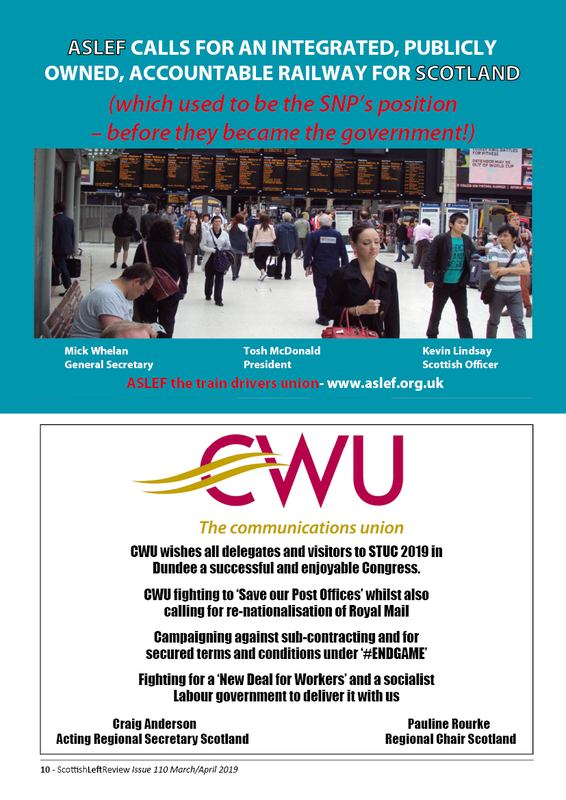 Articles from Mick Cash (RMT), Peter Hunter (UNISON) and Caroline Sewell (Musicians’ Union), for example, show that campaigning is not necessarily predicated on trying to take industrial action though. 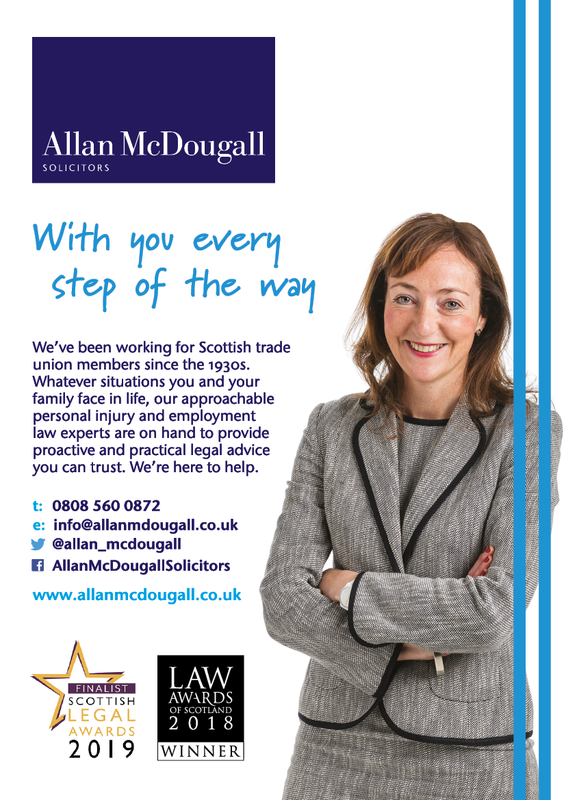 Indeed, as the victory over equal pay at Glasgow City Council shows action of different sorts (industrial, political, legal) was deployed, with industrial action bring matters to a successful conclusion (see article by Jennifer McCarey and Brian Smith). And when industrial action is used, imagination is needed. The latest example of innovation comes again from French workers. Teachers there protesting about the detrimental changes to the baccalaureate have decided, rather than not set or mark the exam, they will simply give every candidate the top mark, making a mockery of the changes. Congratulations to the Save Leith Walk campaign (see Scottish Left Review January/February 2019) after defeating the developer’s proposals and to Edinburgh City Council for recognising the strength of this local opinion. The challenge for the campaign now is to decide what is for and how to maintain its vibrancy in campaigning for that. In this issue, activists in the Living Rent campaign show how they might have found some of the answers to these conundrums. 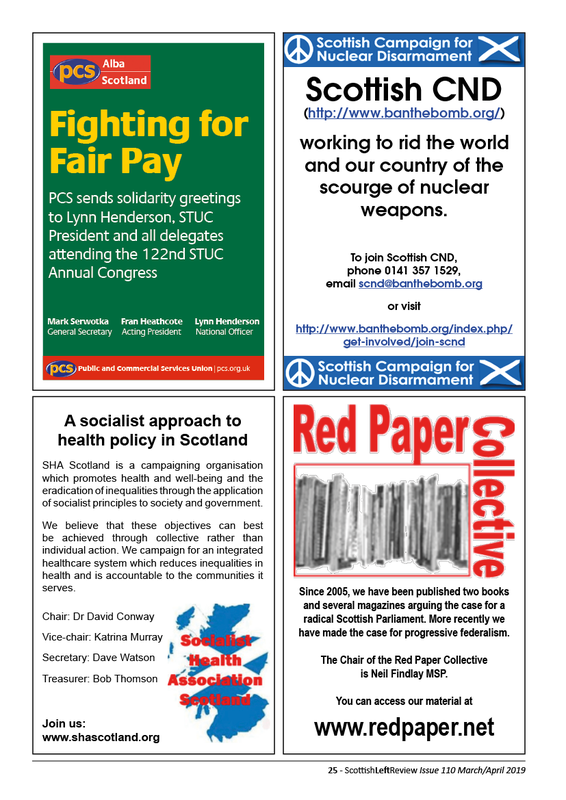 • We’d like to thank Tommy Sheppard for his 17 years of service on the editorial committee of the Scottish Left Review. He has stepped down on account of being unable to regularly attend committee meetings due to his Westminster responsibilities (where he has been an MP since 2015). 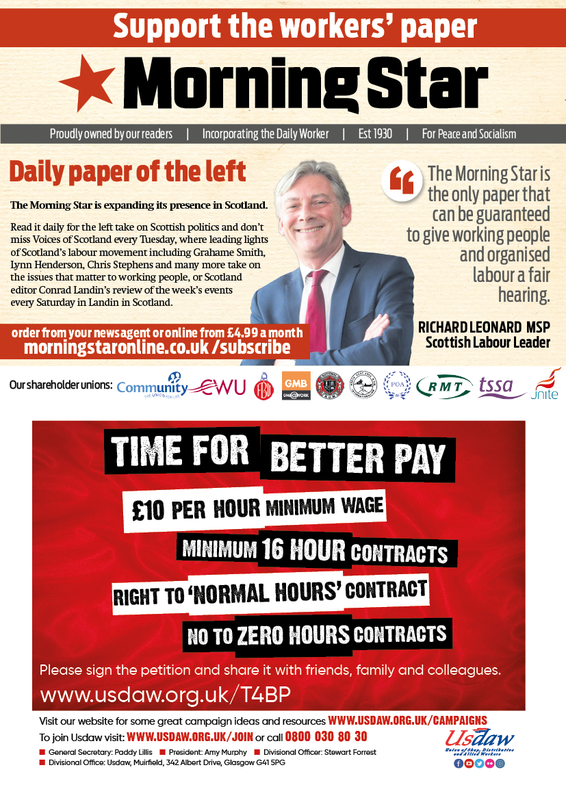 We hope he will still be able to write for Scottish Left Review as he has before though. As readers may be aware, SNP MP Chris Stephens joined our board late last year along with Maggie Chapman, a Co-Convenor of the Scottish Green Party’s National Council.